When you're in the mood to grill up some burgers or steaks, the obvious move is to head to your local grocery store or butcher and snag some choice cuts. But what are you supposed to do when you're craving a juicy T-bone in the middle of the night? 7-Eleven certainly isn't going to have what you're looking for. Soon enough, you may be able to hit up a nearby meat vending machine, thanks to the entrepreneurially minded guy behind The Applestone Meat Company. Joshua Applestone, founder of New York-based company that bears his name, is on a mission to make choice cuts of raw beef, lamb, pork, and more available to the masses 24/7, and has already introduced his ingenious meat vending machines in a couple locations around the Empire State. Now, he's looking to expand the operation quite extensively over the next couple years by installing dozens more and eventually plans to bring them to every city in America, according to a report in Bloomberg. The machines themselves operate much like traditional vending machine stocked with chips and candy, only they're refrigerated and restocked more regularly. 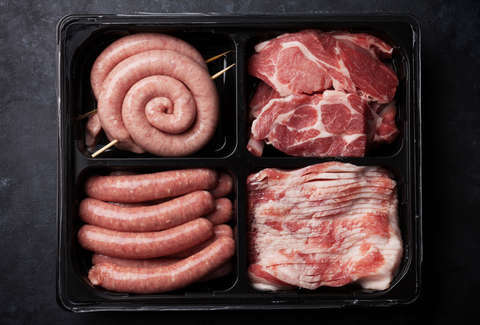 Each one is filled with a different type of protein (beef, pork, lamb, and ground meat and sausage), and they're modeled after old-school carousel-type dispensers where a button rotates the selection inside. To purchase something, customers simply swipe their credit card. The machines currently in operation are so popular that they're selling 3,000 pounds of meat out of them per week. And while the high demand requires them to be restocked several times per day, whatever items don't sell out are removed and replaced within six or seven days. The concept, while fairly straightforward, is going to take some time to scale. To get there, Applestone is developing custom cases that can stock up to 1,000 different items at a time. The other concern will be ensuring the product is of top quality. Applestone was a co-founder of Brooklyn's renowned Fleishers Craft Butcher, and he's built a reputation as being a purveyor of fine prime meats, so maintaining that reputation is understandably a priority. As for when you can expect to see one of these in your neighborhood, Applestone says he hopes to be in Manhattan by 2019, and then expand from there. Until then, you're just going to have to plan ahead for your midnight sirloin hankerings.